Wow, well doesn’t this Alfa Spider look special? After a wait of almost a year since the 4C Spider was first unveiled, Alfa’s roadster has finally landed in the UK – and judging by the lithe shape in front of me, it was worth the wait. The 4C Spider looks even better than the Coupe, I reckon – not something I’d say about every coupe subjected to the tin opener treatment. From the side and the rear three-quarters, it’s got a real mini-Ferrari vibe. Gone is the Coupe’s sloping fastback, replaced by a new roll-over structure, elegant flying buttresses and a new, lusciously curved engine lid. No, you no longer get to see the 4C’s engine through a glass cover, but the triple cooling grilles and subtle rear spoiler look superb. Many enthusiasts were delighted when the 4C Spider appeared with new faired-in projector headlamps, rather than the fussy exposed ‘spider’s eye’ lights of the Coupe. The enclosed xenon front lights look so much neater. If you really want the exposed-style Bi-LED lights on your Spider, you can order them as an option for a whopping £1950. I bet no-one will. The new alloy wheel designs look good, too: either 17/18-inch (front/rear) or 18/19-inch sizes, in silver or dark finishes. If you want the bigger wheels, add on at least £1250 to the price. A new and very bright yellow paint called Giallo Prototipo is now available (which you can also order on the Coupe now), alongside black, red, grey and white; if you want pearl white or pearl red, you’ll have to stump up £2250. The Spider’s spec also includes a new Alpine head unit, which sounds good but looks a bit ‘1990s aftermarket’ to me. I’m about to drive the 4C Spider belonging to Brian Smith, an Alfa Owners Club stalwart who owns four other Alfas, including a Spider S4. Originally, he was after a 4C Coupe. But the low production rate at the Maserati factory – an estimated 2000 a year – means that Brian was quoted a vastly long delivery time: two-to-three years, in fact! Someone mentioned the new 4C Spider to him, and the much shorter waiting time saw him switch allegiance. In fact, Brian was one of the first customers in the UK to put his name against a Spider; he ordered his in May 2015 and received delivery less than five months later. It’s an Alfa Red example with a few extras: red-stitched black leather interior, leather sports steering wheel, dark-coloured alloys (still 17/18in size, rather than 18/19in) and red brake calipers. He also ticked all the boxes for such zero-cost extras as cruise control and parking sensors. Finally, he sensibly had the door sills covered in perfectly matching carbon-effect wrap to protect the scratch-prone sills. And the small format front number plate really works, too. Brian is clearly delighted with his 4C. “It’s fantastic,” he says. “I was planning on keeping it for two years and running it on a limited-mileage policy, but I’m having too much fun in it, and driving more miles than I’d planned.” And now Auto Italia has put a few more on the clock after circumnavigating our test track a few times… So how well does the 4C work as a convertible? The fabric roof is rather like a Lotus Elise’s, and weighs just 7kg, but it’s a bit more robust thanks to stiff strengthening ridges. It’s the work of 30 seconds to remove it – something you can actually do from the driver’s seat if you want to. Simply unfasten the two round clasps in the centre, slide back the latches on either side, roll it all up and tuck it away into its own bag, and you’re off. In place, it seals very well (it latches solidly into a groove in the windscreen top rail) and Brian reports that it doesn’t leak in rain or ‘balloon’ at high speeds. Remove the roof and you benefit from an airiness that’s a real contrast to the coupe’s very enclosed feel. Of course, because you sit so low and have a huge roll-over structure around you, it’s no speedster, but on the sunny day of our test, it was just superb. Alfa is promising a carbonfibre hardtop option in the future. One definite plus of the Spider is its better visibility to the rear – you can see pretty well out of the vertical rear window, right across that luscious rear deck. There’s also almost zero scuttle shake on the move because most of the car’s strength comes from the carbonfibre monocoque (which is shared with the Coupe). The shell has been beefed up a bit, though: there’s a new aluminium rollover structure (hidden by what Alfa calls a ‘halo’ – normally black but which can be covered in carbon for an extra £1800). A new carbonfibre windscreen frame adds strength too, as does a new steel engine bay cross-member. The Spider tub is in fact just 8kg heavier than the fixed-roof model’s. Driving with the roof in place, the 4C is not significantly noisier than the Coupe. Remove it, and then yes, it does become very noisy. As well as the wind factor, the exhaust drones at pretty much all engine revs, but as drones go, it’s a pretty pleasant one. And the standard exhaust in Brian’s car is certainly not as noisome as Alfa’s optional Racing system. The yet-to-enter-production option of an Akrapovic dual-mode titanium exhaust with carbonfibre tips promises a ‘quiet’ mode, though – it’ll be fascinating to see how that performs. Speaking of Alfa’s optional Racing Pack, Brian’s car doesn’t have it; in fact, many 4C owners have been persuaded that standard-spec is the way to go. While the Racing Pack’s enhanced anti-roll bar set-up, blatty exhaust and larger wheels and tyres are all great for track work, many people find it all simply too harsh for road use. Then he heard about the tweaks that Jamie Porter of The Alfa Workshop has been developing for the 4C. As soon as he drove Jamie’s 4C Coupe demonstrator, he immediately knew that it felt ‘right’. Jamie Porter has spent a huge amount of time and effort working with the 4C’s suspension settings to create a feel that UK road drivers will be happy with. Brian opted to fit Jamie’s tweaks to the front end only (consisting of shims and adjusted toe settings). Jamie made a number of adjustments on the car, heading out to test-drive it at least five times before he was happy with it. I have to agree, with these minor alterations the 4C feels fantastically well set-up. Pretty much all the steering twitchiness has been dialled out. No longer do bumpy roads cause the steering to fidget, no longer does the car tram-line, and no longer is there nervousness under braking. All in all, it’s a far more composed, relaxing experience. Significantly, it’s also more satisfying through corners. You’re able to turn in with increased confidence, the 205/45 ZR17 Pirelli P Zero front tyres gripping extremely well. It does understeer, yes, but it can also be coaxed into performing just the sort of controllable oversteer that mid-engined cars should offer. And all with no loss of steering feel. It’s remarkably stable, too. Jamie encourages drivers to give the steering wheel a big heave at speed on the dual carriageway. And you quickly discover that there’s no lurch, no nervousness, just an instant change of direction to where you point it. All in all, this is a superb set-up for road use, ideal for the B-road blasts that you just knew the 4C was always capable of handling confidently. Jamie does rear-end suspension changes, too, which we’ve tried in his development car. But Brian is happy with his car as it is – and I’d agree. For the record, Jamie’s development 4C, which is fitted with a Racing Pack and a number of other tweaks (from rear bushes to increased power), does feel even sharper. By the way, the 4C’s DNA (Dynamic, Natural, All Weather) system also works very well with the Alfa Workshop enhanced set-up, especially in ‘D’ mode, reining in understeer. One thing that hasn’t changed is the powertrain: it’s exactly the same 1750 TBi turbo four-cylinder engine, complete with Alfa’s TCT dual-clutch semi-auto transmission. With 240bhp and 258lb ft, the performance figures are exactly the same as the Coupe, too: 160mph and 0-62 in 4.5 seconds. That’s in spite of a slight increase in weight: while the Coupe weighs 895kg, the Spider is some 45kg heavier at 940kg, even after Alfa fitted 10 per cent thinner glass for the windscreen and side windows. The Spider’s UK price is £59,500, or £8000 more than the recently upgraded 4C Coupe. That puts it in pretty rarefied territory – you can buy a 350bhp Lotus Exige S Roadster for £4k less. 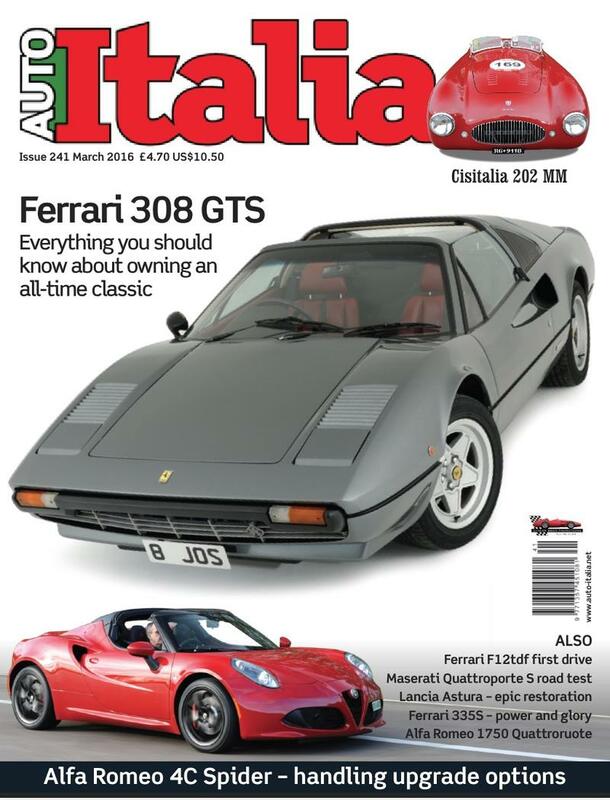 Alfa lists lots of tempting options to bump up the price, too: carbon trim, leather trim (£1400) or leather and microfibre (£1780) and of course the Racing Pack (uprated suspension, tyres, exhaust and steering wheel) at £2000 – although we’d avoid that. You can easily approach the £70k mark, at which point the 4C is pricier than the 385bhp Porsche Cayman GT4. Still, Alfa fans would never consider the 4C Spider to be in competition with cars such as these. And I agree: the 4C sits out on its own. The limited-production, hand-built nature of the 4C makes it very special indeed. And in Spider form, it’s become even more desirable. In fact, I’d go as far as to say that – particularly with the front-end mods that this car has had done – the 4C Spider emerges as the most desirable Alfa for a very long time. Probably since the 8C Competizione, in fact, which is high praise indeed. With the arrival of the 4C Spider, the Coupe’s spec has been bumped up. New standard equipment includes an Alfa Hi-Fi sound system, ‘luxury’ floor mats and Bi-LED headlamps with carbonfibre surrounds (or for £360 you can have the Spider’s enclosed bi-xenons). Parking sensors and cruise control are now free options on all 4Cs. The price has gone up, though, by £5500 – the cheapest 4C is now £51,500.